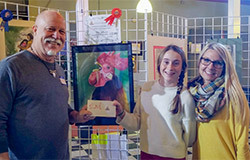 Forty students from eight public and private middle schools in New Hanover County recently participated in an art exhibit and juried art show at Morning Glory Coffee House. 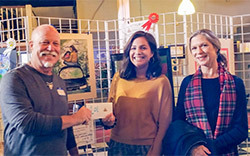 Watson College professor Janna Robertson coordinated the event in partnership with Morning Glory owner Tim Kenny, local artist Will Balance and area art teachers. The exhibit opened on November 29 and ran through December 8. Student participants, teachers and event coordinators all agreed the event was a success. Robertson said the group plans to make the Morning Glory Coffee House Middle Grades Juried Art Show an annual event. They also hope to extend the opportunity to high school and elementary school aged children in the future.